Pucky fans of new and old can stop wishing upon a star right now. 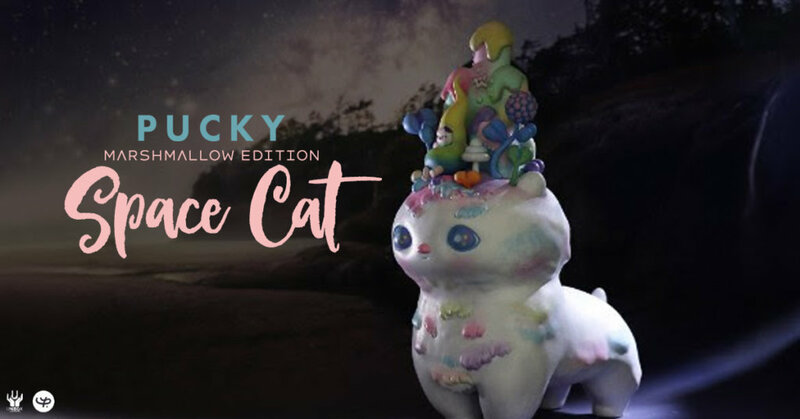 The highly anticipated new colourway of Pucky’s Space Cat will be made available this weekend online via Unbox Store! Seen at various conventions and solo shows Collectors have been waiting for this weekend for a long time and the wait is nearly over. Get your F5 trigger fingers ready and your middle finger for the flippers out their as Space Cat lands on earth. Unbox is proud to offer the sought after SPACECAT by Pucky! The cosmic feline from another planet combines figural and diorama to present a truly original work of art. MATERIAL: RESIN AND ABS STYLE PU. With a childhood divided between Hong Kong and Canada, Pucky grew up between two cultures, which prompted her to explore creatively the value of identity and the meaning of belonging. After graduation from Emily Carr University of Art + Design in Vancouver in 2008, she returned to Hong Kong, where she works as a freelance artist and illustrator and created the brand “Pookie”. Pucky’s work is a combination of cute and dark, showing an integrated harmony where opposites like good and evil or love and fear, co-exist. She is deeply inspired by the wonders and mysteries of the world and her drawings are strongly affected by the beauty of their history, science and romance. She draws to communicate these feelings in her own visual language. Find Pucky via http://www.hellopucky.com/ Facebook and Instagram.